Mattress Cleaning is a very fast growing industry in health conscious Britain. We have all heard the stories of the Mattresses weighing 10% heavier after 3 years due to dustmites living in them. 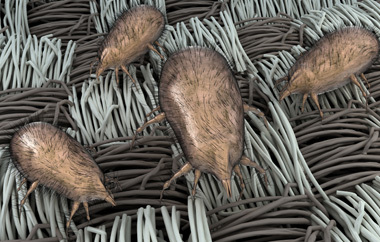 These Dustmites live and breed using our dead skin as food, until now there has been no effective way of totally eradicating them from mattresses. Yes we can kill them all by cleaning them, but they will return within a few weeks. Now I am pleased to announce that using a product called Mattress Medic, which can be sprayed onto the mattress after cleaning, that we can stop them from breeding, and totally eradicate them. This will lead to a healthy mattress. We have cleaned hundreds of mattresses for domestic and commercial customers. In the domestic market it typically is for Asthma sufferers to help them have a more peaceful nights sleep, and in the commercial market, for Hotels, B& B’s, Care Homes, helping them to give a clean and healthy room. To use a Turbo Hoover on all of the mattress. This turbo hoover, is a water filtration hoover, so does not rely on a filter, which can get blocked, the turbo hoover creates tiny vibrations which will lift the dust, and dust mites out of the mattress. Depending on soiling, or staining we may steam clean the mattress, and treat any mattress stains, although stain removal on mattresses is not always successful, as very often stains have been on the fabric too long. We apply a product called Mattress Medic, which will help to kill off the dustmites and stop them from coming back. Please note that regular hoovering, and turning of the mattress will help the mattress remain clean and healthy. We recommend yearly cleaning of mattresses. Many of our clients to choose a pre-booked system so that it is something that we remind them of when the time comes closer. It may be a good idea to consider our carpet cleaning services at the same time.